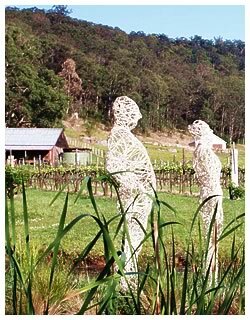 Dont' miss this annual exhibition of dynamic site specific sculptures set in the picturesque vineyards of Historic Wollombi Valley. This will be held during November 2016. Some of the artists are internationally known, some are locals including the Hunter region and some are Sydney based. An electic mix of art and wine, this exhibition combines a taste of fine regional wines with a drive through some of NSW's most historic and picuresque countryside. Each of the vineyards provides a very different setting encompassing vineyards and valleys with superb views. Many of the sculptures are site-specific to express a comment on society or a link to the environment such as the vigour of the vines or more contraversial themes. Some of our sculptors are local such as internationally known Paul Selwood and Ross Fletcher from Wollombi. Visit and vote for the 'People's Choice Award'! Margaret has an arts degree from NSW University and a fine art diploma from the Art Gallary of NSW. She studied drawing at the Julian Ashton School of Art, landscape with Trish Coop and oils with Robert Bosler. Margaret is best known for her equine subjects, especialy racehorses. She has held exhibitions at our major racecourses including Broadmeadow and Rosehill. Commission have ncluded such champions as Sunline and Doriemus. 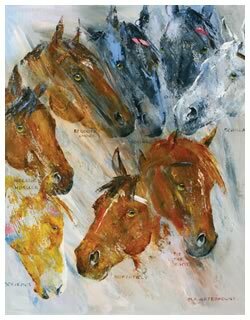 She is equally well known for her polo paintings and exhibits at the famous El Dorado Polo grounds in Palm Springs. The working dog is another subject she enjoys and has accepted commissions from all over the world. However, wildlife art gives her the greatest enjoyment. She depicts all animal with movement, strength and dignity. Margaret regularly enjoys road trips through the American west where she draws inspiration for he scenes of cowboys or animal with the backdrop of dramatic wester cenery. These paintings are exhibited at the gallery at Rancho Elenita in the Coachella Valley - www.ranchoelenita.com. As one collector said: "You bring colour and excitement to many - I am among those - sincere thanks". Helen Fitzgerald is an Australian Wildlife and Botanical Watercolour Artist, Teacher and Illustrator. She holds a degree in Applied Science and Art Education and has studied overseas at the University of Vienna and the University of Perugia in Italy. Helen won a gold medal at the Royal Horticultural Society flower show in Westminster. London in 2002 where she exhibited eight of her eucalypt paintings for the show. With this gold medal Helen joins a select club of first ranked internatinal artists who have achieved this in London. 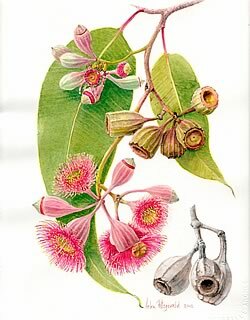 Helen's botanical paintings cover a wide range of Australia's diverse flora. Helen moved to Queanbeyan, NSW where she teaches in various Carnberra tertiary instiitutions. Some of her works are featured in our gallery or you can viist her webiste. www.helenfitzgerald.com.